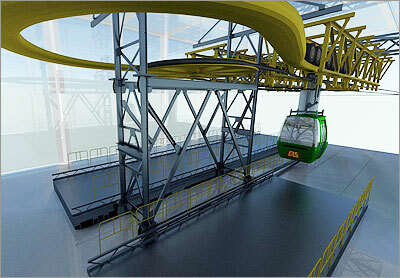 CURVO Ropeway concept is a unique non linear concept permitting Ropeway, for the first time in the world, to be amenable and adaptable to bends and curves of city roads. It will be an elevated and aerial mode of urban transport. It will run along existing arterial and other roads on steel column/portal frames spaced at 90-100 mtrs. supporting the ropes. It will need nominal ground space for stations and rope supporting frames. It will have no interference with road spaces and vehicular traffic below, or with pedestrian flow. Running on electricity CURVO eliminates polluting effect of poisonous and green house gases as systematically spewed by vehicular transport. By the same token. It can be made to travel at an average speed of 12.5km./hr, inclusive of boarding /deboarding time, irrespective of route alignment, thereby cutting down on commuting time, considerably. Cabins aesthetically designed and spaced at 22-25 seconds interval, cruise by overheard, a pleasing sight to the beholding public at large in comparison to vehicular congestion below. Cabins would have capacities of 8-10 seats. Since, under no circumstances, as opposed to vehicular or metro rail travels, no standing or overloading can be allowed on the ropeways, the quality of ride will be extremely comfortable for the commuters. It will, on any designated route, provide boarding / deboarding facility at every 750 mtrs. or so, making it convenient for commuters to approach their intermediate destinations. The stations will be provided with elevator service to assist passengers reach level of the station. In the system, once a cabin reaches a station, doors open automatically and facilitate boarding / deboarding at very low speed. The carrying capacity can be so designed and augmented as to ferry 2000-2500 passenger per hour (pph) in each direction on a single track. A study on Kolkata city revealed possible overhead CURVO capacity of more than 200,000 commuters per hour, through multitude routes, which could be equivalent to 3000 bus load of passengers per hour. 3000 buses would, as a ball park estimate, consume around 5000 liters of gasoline per hour!! Estimated power consumption for running an equivalent CURVO system for one hour would be approximately at around 12 MW only. Benchmarking and factoring in preceding features, one can well imagine as to how the exchequer can be benefited through the introduction of this system in city routes. Terminal stations will be equipped with a Drive or Tensioning Device. Operation control will be from Drive Station. Sections will be interlocked for simultaneous operations. The entire system will be under constant CCTV surveillance. Risk of accidents is successfully eliminated by pre-empting the vehicular accident factors, viz. Poor condition of surface road conditions etc. Construction of the system to take place only during night hours between 10.00 p.m.to 06.00 a.m. Normal traffic on the concerned route will not be disturbed. While carrying out construction of Metro and Flyover foundations / structures, it causes acute disturbance to underground utilities. But, foundations of CURVO system being comparatively of much lighter and being located on kerbs, placed at sizeable intervals, disturbance of utilities under CURVO footings will be of miniscule nature. Last but not the least, installation & maintenance of CURVO system is relatively convenient and expeditious for reasons enumerated above. 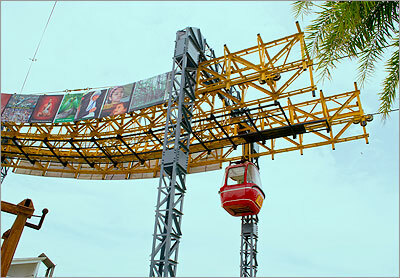 A prototype full scale CURVO Ropeway has been designed and constructed over a short stretch, accommodating two terminal stations and two intermediate angular modules. It is full size operating model which accommodates buses and trucks, negotiating under it along the stretch. Passenger cabins will travel along with Rope on the system to demonstrate the CURVO feature. 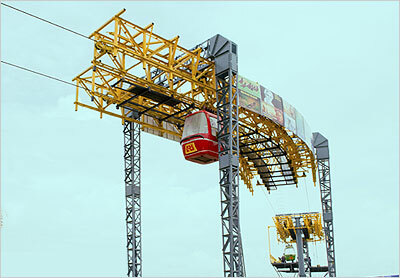 CONVEYOR & ROPEWAY SERVICES PVT. LTD. (CRSPL), has courage in our conviction that the Curvo ropeway can extend a fortuitous presence to the high volume of daily commuters.